Chelsea v Manchester City - A view from the opposition. As Chelsea prepare to take on Pep Guardiola's free-scoring Manchester City tomorrow night, We look at the oppositions view in what will prove to be a mouth-watering game. Introducing David from City Watch. What do you make of Manchester City's summer signings? I'm extremely happy with City's summer transfer business. Ederson was signed almost immediately and has already put to bed the goalkeeping issues that we suffered from last season. He is quickly becoming a fan favourite with his fantastic attitude and ability. His distribution is the best I've ever seen from a goalkeeper and at only 24-years-old, he has a long and exciting future ahead of him. The full-backs, Mendy, Walker, and Danilo, have all hit the ground running so far in Sky Blue and that doesn't look set to change anytime soon. All have been extremely impressive and I’m delighted with all three of them. It was an area that was neglected for so long so the expensive outlay was needed badly. Bernardo Silva was a huge coup that was largely forgotten about as it was wrapped up within the first week of the window. He is one of the most exciting footballers in Europe and lit up the Champions League last season. He hasn’t found his way into the team yet but is largely seen as the heir to David Silva’s throne. What do you believe are your biggest strengths and weaknesses? Of course, going forward is a massive strength of ours. Our frontline of Aguero, Jesus, Sane, Sterling, Bernardo, De Bruyne, Silva is absolutely frightening and recent weeks have shown just how devastating we can be. With Benjamin Mendy now ruled out for months on end and no recognised left-back in the squad, we’re still spread too thin at the back. We have cover in Danilo, and potentially Fabian Delph, but with Kompany’s fitness unreliable, we still need another two defenders to really cement our backline in place. Saying that, we have only conceded two goals in the league so far and John Stones has demonstrated the huge talent that he was tipped to be. A monster so far this season. Who is your key man this season? Look no further than the Ginger Prince himself – Kevin De Bruyne. Chelsea fans will rue the day they let the ‘£60m flop’ leave Stamford Bridge. De Bruyne has already demonstrated his versatility this year in Pep’s side, playing wide, centrally and also as a deep lying playmaker. There seems to be no end to De Bruyne’s ability and he really does make the side tick. His vision and execution of a pass is truly remarkable and continues to excel under Pep’s tutelage. What is the minimum expectation from your team this season? I will be very happy with a top three finish and a good run in the Champions League. Of course, an FA or Carabao Cup will be nice but I would rather focus on the more prestigious competitions. There seems to be a pressure on Pep to win absolutely everything this year because he’s spent some money, but I don’t see it like that. An improvement on last season is needed, but there is still work to be done on the squad. What is your impression of Chelsea ahead of the game? Despite the 3-2 blip at home to Burnley, Chelsea have been extremely impressive so far this season. You only have to look at the 4-0 demolition job at Stoke last weekend or the clinical display in Madrid this week, they are a top, top side right now. With the United and City narrative hogging the headlines so far, Chelsea have gone under the radar and have quietly gone about their job superbly well. I am a big fan of Conte and the football he likes to play, and I certainly see them challenging for the title again. After recent weeks, I was extremely confident going to Chelsea. Now, after Mendy’s long-term injury and Aguero’s freak car accident, I am starting to have some doubt. The Bridge is a tough place to go for anybody, especially when Chelsea are in fine form. Pep and Conte are both superb managers with great tactical awareness. Could be a cagey affair so I’ll be very happy to take a point away from the game. 2-2. Thank you to David from @City_Watch for his views. Feeling optimistic? Back the Blues to win - we win? You get the return of your £10 BET and it's winnings, AS WELL as £20 FREE! Feeling pessimistic? Back City to win - they win? 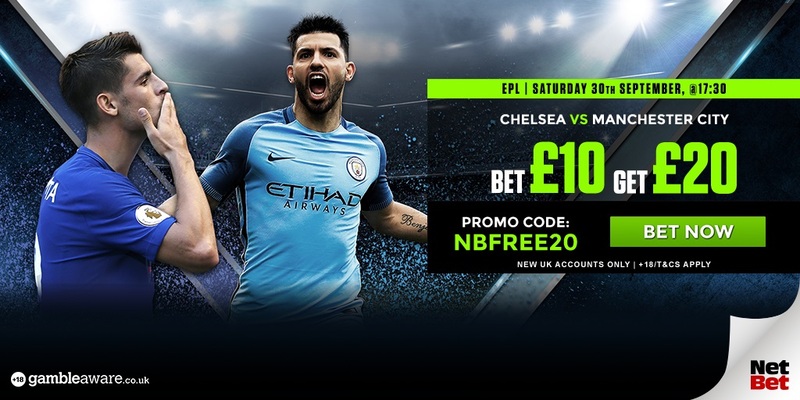 You get the return of your £10 BET and it's winnings, AS WELL as £20 FREE!